My offering for Chocolate Friday this week is a fun recipe for Christmassy brownies. This recipe can be as easy or as hard as you want to make it. If you're a "from scratch" kind of person, or if you have a ton of time on your hands and nothing to do, you could make all the ingredients from the ground up. Or the bowl up, as it were. I'm not fussy about brownies, and as I've said many times, I'm a lazy git. So I started with a brownie mix. I did make the frosting though, because you just can't get the same flavor from the premixed frostings. If you need recipes for "scratch" brownies, try the BCCY version or the healthy brownies from Recipezaar. Bake brownies using your favorite mix or recipe. Since these are VERY rich, bake medium to thin. Either split into two and spread over bottom of two 8x8 pans, or spread thin over a 9x12 pan. Allow to cool. Mix together cream cheese, butter, peppermint extract and powdered sugar until creamy. Pour a few drops of red food coloring into mixture and stir lightly with a spoon or knife, just enough to get streaks but not thoroughly blend the color. Spread thickly over brownies. 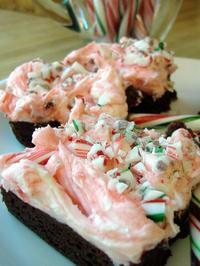 Sprinkle crushed candy cane over the top and press the pieces down lightly into the frosting. Chill to allow the frosting to set up. Serve to your favorite elves. Note: If you love the combo of chocolate and peppermint like I do, add some crushed candy canes to the brownie batter and bake the flavor right in. It adds a nice little crunch, too. Hershey's makes some great Chocolate Mint candy canes that you can probably find at your local grocery store. It is believed that anything auspicious should be welcomed with some sweets items. ‘Muh mitha karwao’ (serve sweets to sweeten the mouth) is the statement ruling the lips of any Indian on any occasion right from birth of a child, getting a job, achieving a reward to good academic record, fixing of a marriage engagement, marriage anniversary and the list goes on. I love to make different type of candy. today I got this recipe. I will try this. This blog is really very informatics. we'll try to make some of these on the event of coming Christmas. Enjoy Christmas with Christmas chocolates. Can't wait to try it, I guess the week after Easter is too soon...? These look great. I'll definitely try them. No, that didn't happen to mine. I don't know why. I looked at your frosting recipe and yours doesn't have cream cheese, so maybe that kept the moisture from being absorbed in mine. Also, I did put them in the fridge to chill for a bit so that probably helped too. Good luck! Your'e my kind of girl. I also start many of my recipes with a box mix, as I did with my recipe this week.